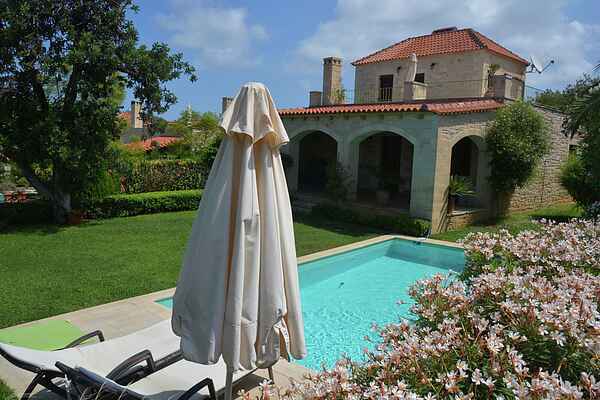 Villa Arianna is a beautiful, traditional stone house with a private pool. Situated on a gentle, west facing slope, with mountain and sea views. This well equipped house is on a quiet cul-de-sac on the edge of quiet Prines. A gentle stroll leads to the village centre, where there is a mini market, a choice of tavernas and cafe bars. The house is set in a generous, well cared for garden. Prines is 6 km west of the Rethymno’s old Venetian harbour. Rethymno has an amazing choice of eating establishments, cafes and shops. The nearest beach is 3 km away. An hour’s drive takes you to: the beautiful beaches on the south coast of Crete, west to Chania or east to Heraklion. This spacious villa has 3 bedrooms and 2 shower rooms with a large outdoor dining area on the porch with a gas BBQ. The upstairs bedroom, with the second shower room leads onto a large balcony where you can watch the sunset over the sea. The two downstairs bedrooms share a large shower room, WC, bidet and washing machine. The interior features stone walls and wooden beam ceilings with unique light fixtures. Enjoy the large pool with sun beds surrounded by manicured landscaping with abundant flowers. The nearest beach to the villa is 3 km away. An hour’s drive takes you to: the beautiful beaches on the south coast of Crete, west to Hani or east to Heraklion. A stone Cretan archway leads to a large, fully-equipped kitchen with dining area and includes all appliances and a spacious living room with satellite TV, DVD, CD players, Wifi and fireplace.